Note: This is the second in a series of articles detailing the conception, evolution and execution of a new Charleston RiverDogs promotion. 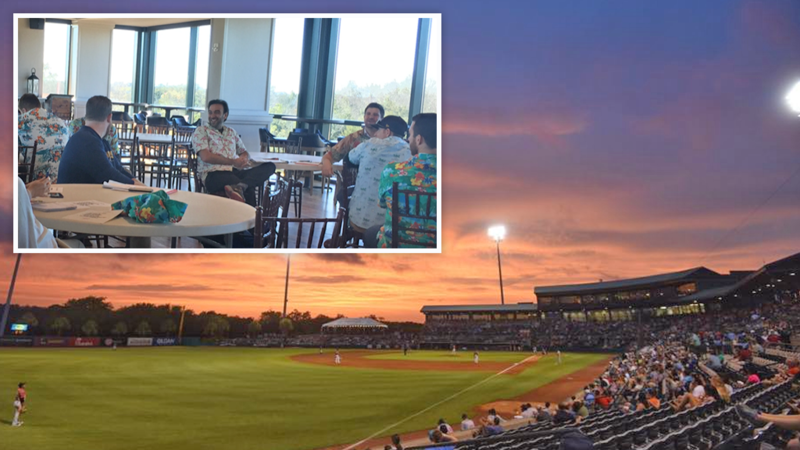 When we last checked in with Charleston RiverDogs promotions director Nate Kurant in the wake of the 2018 Minor League Baseball Promotional Seminar, he was both despondent and optimistic. The former emotion was a result of the RiverDogs failing to win a "Best Theme Night" Golden Bobblehead Award for their "Color Night" promotion; the latter was because, well, hope springs eternal. Kurant began to feel sure that 2019 would be the RiverDogs' year, hinting at a coming promotion that was going to be unique, experiential and entirely worthy of winning a Golden Bobblehead. It's three months later and, as is often the case, things haven't gone exactly as planned. Kurant's aforementioned big promotion project might not happen at all. It's an ambitious idea, both conceptually and technologically, and he now has doubts about pulling it off. "A lot of it is beyond my scope, and I still haven't found anyone who can do it cost-effectively," said Kurant, who started his Minor League career with the Dudedin Blue Jays and is entering his fourth season with the RiverDogs. "It's still in the works. But as with some ideas, it's not always cut and dry." This particular one -- which requires the services of an app developer -- is currently on the backburner. But, ever since the early-October conclusion of the Promo Seminar (since rebranded as the "Innovators Summit"), Kurant and his fellow front office staffers have been brainstorming new ideas. "The Promo Seminar, for our staff it was in part a bonding experience," he said. "I was very excited that so many people from our staff got to go, so they could see a different side of the job. If you do sales or community relations, then you don't see the ins and outs of this role, so they got to see behind the curtain. "And then it was great to get back from the Seminar. You've got that enthusiasm, like the beginning of a roller coaster. You're past the initial climb and ready to go downhill. We've got some ideas we're working towards, and failed on some already. But that's par for the course." During the offseason, Kurant holds weekly promo brainstorming meetings. "We'll have meetings in the clubhouse, or the suites, or change the venue entirely," he said. "It changes how you think. The last meeting we had, we all went ice skating for an hour and then held the meeting. It's good for morale but it also gets you out of your comfort zone and that invigorates the thought process. Keeping things light and fun and creative, that's how we stoke the fire. "The [baseball] schedule is overwhelming, and coming up with new ideas is tough. We're always looking for new ideas, and you never know who's going to come up with something. We don't want to do the same old stuff. Giving out bobbleheads, throwing out T-shirts, that is what it is. But you're always looking for a way to go above and beyond." Video: Re-live the magic of Color Night from this year! All of this brings us back around to the big question: What sort of innovative promotions are the RiverDogs planning in 2019? Kurant excitedly mentioned several. One, along the lines of the aforementioned "Color Night," is centered around a shared fan experience. Another puts an irreverent spin on an anniversary celebration, significantly altering its original meaning. But Kurant expresses the most enthusiasm for a promotion that, in one form or another, will likely be happening in April. Many of the details still need to be ironed out, including potential legal counsel. "There are a lot of different layers we're working with," Kurant said. "This hits different departments -- sales, community relations -- we're going to go A to Z on this." Going "A to Z" involves reaching out to possible celebrity guests, a world record attempt, a first-of-its-kind theme jersey and many other aspects. It's a work in progress, subject to change, but it will be happening in one form or another. "Nobody's done this, so you have no idea how to do it," Kurant said. "There's no information. You're the hypothesis, you're the test example. It's exciting and fun." Kurant won't be going it alone, of course. He said that this particular promotion has benefitted from "support from the top down," before going on to praise the contributions he's received from his front office colleagues as well as third party vendors who will contribute key visual elements. "If you can give everyone an idea that makes them excited, they'll help you out and make it work," he said. "On my side, it's been great to have people buy in. When people buy in, they add to the idea and that's so helpful." It's all a work in progress, but Kurant feels that the RiverDogs have a great shot at winning a Golden Bobblehead in 2019. "We're operating outside the norm," he said. "It's all about expanding what's possible." Part Three of this series will include specific behind-the-scenes info on the promotion in question as well as the perspectives of the individuals who contributed to it. The article will appear in conjunction with the release of the RiverDogs' promotions schedule.